Over the course of his career, Mike Leah has won five WSOP Circuit rings and a World Series of Poker bracelet. 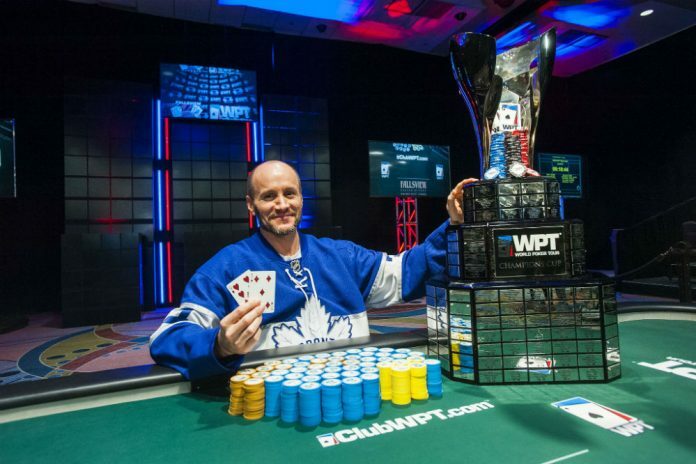 On Monday night he captured his first World Poker Tour title, winning the WPT Fallsview Poker Classic for $359,001. The victory is Leah’s fourth career win at the Canadian casino and third in three straight years. His three other wins all came in the $1,100 buy-in event that traditionally opened the weeklong festival. Despite starting the final table with the third biggest stack, Joe Ferrier lasted just nine hands before exiting in sixth place. Leah raised from middle postilion to 150,000 and Ferrier re-raised to 375,000 from the button. Leah responded by moving all in for 4,400,000 and Ferrier called all in. Leah tabled which put him ahead of Ferrier’s . The flop gave Ferrier a backdoor flush draw but neither the turn or river were any help and Leah picked up his first elimination. About 30 minutes later, Daniel Wagner was shaking hands and saying “good game” after going out in fifth. Down to just 385,000, Wagner moved all in from UTG and got a call from Carlos Chadha in the small blind. Wagner was ahead with to Chadha’s but the flop changed that. Wagner could only watch and grimace as the hit the turn and completed the board. It took 62 hands and 2.5 hours to find the next elimination. From UTG, Chadha moved all in for 1,365,000 and Ryan Yu called from the big blind. Chadha tabled and was racing against Yu’s . The flop kept Chadha in front as did the turn, but the river gave Yu top pair and send Chadha out in fourth place. Just 10 minutes later, Yu picked up another elimination. Tim Rutherford moved all in for 1,360,000 from the small blind and Yu called from the big. Rutherford turned over and was drawing live against Yu’s . The runout kept Yu ahead and send Rutherford home in third place. When heads up play began Yu had 70% of the chips in play. That changed quickly after Yu and Leah had taken an unscheduled break to discuss a deal. Over the next three hands, Yu lost almost all of his stack without seeing a flop. According to official WPT live updates, Yu raised to 4,000,000 from the button and Leah moved all in for 4,695,000 an Yu responded by folding. On the next hand, Leah limped his button, Yu raised to 5,000,000 and then folded to Leah’s 8,715,000 shove. On the third hand of play between the two, Yu raised to 1,700,000 and Leah again moved all in. Yu folded and left himself just 40,000 – 1/3 of a big blind – to work with. It took three more hands before Leah finally eliminated Yu to win his first World Poker Tour title.